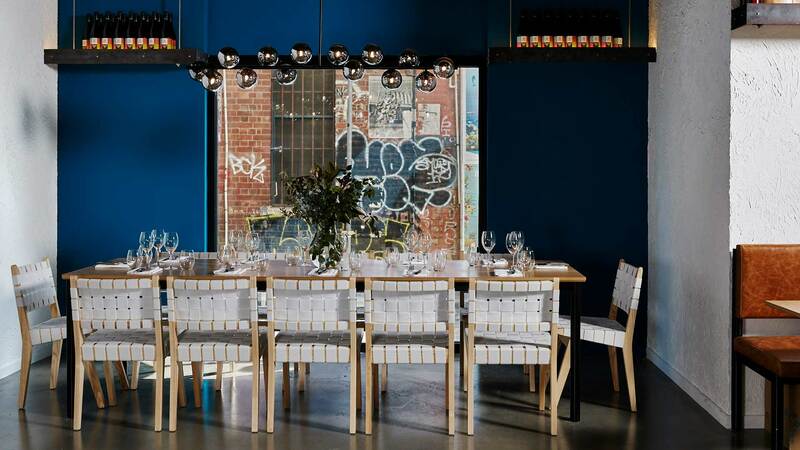 A Berlin-inspired diner by the Copper Pot Seddon team in Fitzroy. Just a few months in, Gertrude Street's Messer has had a shake-up, reinventing itself as a modern, Berlin-inspired diner. Chef-owner Ashley Davis — also the mind behind European Seddon spot, Copper Pot — is further tapping into his decade spent working and travelling across Europe, to plate up a fresh culinary concept. Leaning into its original name — Messer means 'knife' in German — the 45-seater is now serving a menu of reimagined German classics, alongside contemporary creations and a sprinkling of dishes embracing a wider Euro focus. Snacks might include the likes of sweet and sour beetroot ($8), or a duck currywurst snag ($10) served with crisp potatoes. Meanwhile, hungrier appetites will appreciate plates like the käsespätzle pasta ($18) with kale and aged gruyere, rotisserie-cooked pork chop with kohlrabi and cider ($35), or the schnitzel ($25) in a pretzel crumb. Staying true to the Berlin brief, there's a range of crisp, German biers available by the stein for the full experience. Alongside that, a wine list champions both Euro-made styles and their local expressions, and the lineup of cocktails is one befitting any true Berlin drinking den.